Have you been getting collection calls or letters demanding that you pay an old debt? Have these notices been about a debt that you’re not sure belongs to you? If you’re in one of these situations, the next logical step is to send a debt validation letter in order to verify that the debt is yours, and that you do indeed owe the balance. But what goes into a debt validation letter? And when should you send one? Don’t worry, we’ll go over everything you need to know in order to feel confident in sending that debt validation letter. How Does a Debt Validation Letter Work? Why Should You Request a Debt Validation Letter? What to Ask in a Debt Validation Letter? How Long does a Debt Collector have to Validate a Debt? What Happens After you Send a Debt Validation Letter? A debt validation letter is nothing more than a letter that is sent to consumers to verify an existing debt by providing evidence of the claim. The Fair Debt Collection Practices Act (FDCPA) guarantees that all consumers have the right to know how a debt was incurred, and a debt validation letter has this information. A debt validation letter will outline the debt you’re being asked to pay, providing specific information about the debt. 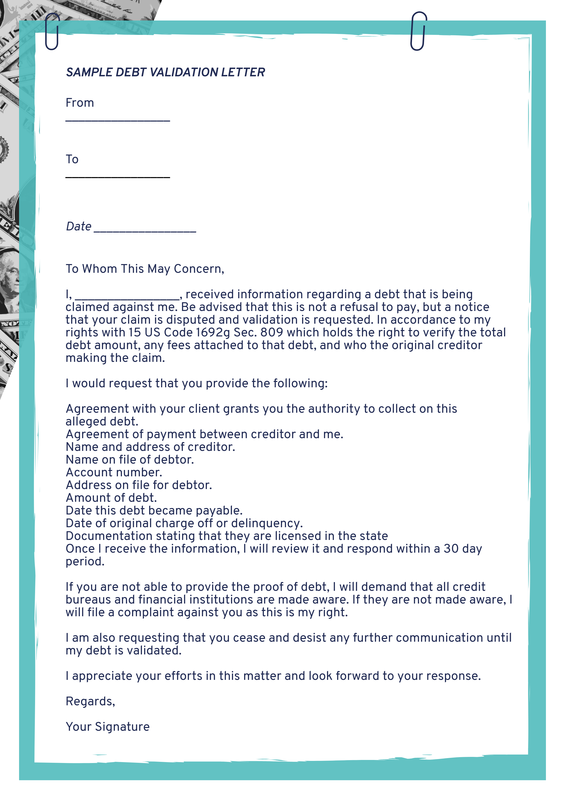 When you receive a letter that’s attempting to collect a debt that you do not believe is yours, you should challenge it with a debt validation letter within 30 days. If the collector intends to respond to your letter, you should expect to receive a response back in 30 days. The collector might call you to verify your address in order to send the debt validation letter. You should be aware that you not obligated to provide this information to them. However, not doing so could have serious consequences. The longer the debt goes unpaid, the more it will affect your credit score. Your history of missed payments will continually be reported to the three major credit bureaus, further decreasing your score. And if you’re requested to appear in court for the debt, the judge won’t look favorably on you stating that you never received a letter because you did not want to verify your address. It will simply look like you’re not ready to take responsibility for your debt. Be sure to provide the information necessary and deal with the situation when it arises, because pushing it off is only going to hurt you in the long run. We all know we should pay our debts. But, a #collection agency does not have the right to harass you! If you receive a letter in the mail that you owe a debt, you might just go ahead and pay it without really looking into it too much more. But, the reality is that there are some cases where requesting a debt validation letter might be more advantageous for you. Debt collectors have been known to send bills and make collection calls for made up debts. Not all debts you may receive will actually be real, many of them may be made up. While they may have a legitimate look and the information might seem right, it’s easy enough to get enough information on someone to try and get money out of them with fake collection notices. Sometimes it might seem that the debt belongs to you because you remember the details of it, but the question is are you sure you haven’t paid it already? By asking for evidence, you’ll get proof that the debt is real and whether or not it has been paid in full. In some cases, debt collectors will bring up old debts that you may have already paid on. Be sure to ask for the original documentation and evidence showing that the debt belongs to you as they probably won’t have this on record. If there’s no proof that the debt belongs to you, you are not required to pay it. Some collectors try to collect on debts that they are not authorized to collect on. A debt validation letter will confirm who and how much you owe. If you end up paying the wrong collector, realize that means that the real account is not paid off and you’ll be subject to the same consequences as if you never paid at all. If you know that the debt belongs to you and you really owe that money, there’s really no point in sending a debt validation letter. Instead, you should try and arrange something with the collection agency. At the end of the day, if you can’t pay it on your own, you can look into other options like debt settlement. Push the debt collector to request and obtain more information about you than they started with in the first place. Sometimes when you request a validation of debt, collectors will get upset by the request and might pursue legal action. (Some collectors don’t like to be confronted). The collector might be less willing to negotiate a deal with you as they now know you have intentions of resolving the situation. This doesn’t mean that you shouldn’t request a letter, it’s just some things to keep in mind when you’re considering sending a debt validation letter. When requesting a debt validation letter, you should make sure to add in enough questions that’ll help you determine if this debt is yours or not. The more information you can obtain from the collector, the easier it will be for you to identify if this debt really belongs to you or not. You also need to check into the statute of limitations on the collection. Each state has its own deadline for the collection of debt. Once the deadline has passed, you are no longer legally obligated to pay on that debt. The statute of limitations starts from the date you make your last payment or acknowledgement of the debt. The usual time-frame of statute of limitations to expire is anywhere between three to five years from the date you made your last payment. But keep in mind that every state is different and you could have to wait longer, in some cases even up to 10 years. To find the statute of limitations in your state, just head over to Google and search “statute of limitations for debt of “your state’s name”. You can request the debt collection company to provide evidence that states that the debt is still active and hasn’t expired. At this point, the collection company has no right to take any legal action against you in the attempt to collect the debt. When you dispute the validity of a debt it doesn’t mean that you are refusing to pay, it just means that you want to confirm that debt is legit and you are legally obligated to pay it. If they end up not being able to validate it, you have no legal obligation to pay them. I, ________________, received information regarding a debt that is being claimed against me. Be advised that this is not a refusal to pay, but a notice that your claim is disputed and validation is requested. In accordance to my rights with 15 US Code 1692g Sec. 809 which holds the right to verify the total debt amount, any fees attached to that debt, and who the original creditor making the claim. Agreement with your client grants you the authority to collect on this alleged debt. Agreement of payment between creditor and me. Name and address of creditor. Name on file of debtor. Address on file for debtor. Date this debt became payable. Date of original charge off or delinquency. Once I receive the information, I will review it and respond within a 30 day period. If you are not able to provide the proof of debt, I will demand that all credit bureaus and financial institutions are made aware. If they are not made aware, I will file a complaint against you as this is my right. I am also requesting that you cease and desist any further communication until my debt is validated. I appreciate your efforts in this matter and look forward to your response. Once you send the letter, the debt collectors don’t have a specific timeline to respond in. Typically, you’ll receive your response within a 30 day time-frame. If you do not hear from the debt collector within 90 days of your request, it’s unlikely that you will hear back. If they are unable to validate your debt, it’s possible that they could sell it to another agency to get something out of the deal. While they are validating your debt, no debt collector can contact you. They’ll only be allowed to contact you once the validation of debt is completed. So if it takes a few months to validate the debt, you should not expect to hear from the collection agency during that time. If they respond, they will most likely only send you some of the information you’ve requested as the FDCPA does not require the debt collector to respond to all your requests. Once the debt collector responds to your validation request, they’ll be allowed to move forward in collecting on the debt. This will be the same time in which you have to start making a decision of what you are going to do, whether it be pay the debt back in full or try to settle for less through negotiating. A debt validation letter can help protect you from paying a debt that you do not legally owe. When you receive a notice that you owe a debt that you do not recognize, it is a good idea to send a debt validation letter and verify before you do anything else. If you do receive proof that the debt belongs to you, you’ll then have the opportunity to take care of it. In the event that you’re struggling to pay the debt back, this is when you would start looking into options for additional help, like debt settlement. Have you sent a debt validation letter before? Let us know in the comments!